More Americans live in high-poverty neighborhoods than ever before, according to a recent Century Foundation report, and many of them struggle to provide enough healthy food for their children. Children in these communities need the healthy breakfast and lunch that they can get each day at school. Their families count on those free and reduced-price meals to help make ends meet. Unfortunately, many of the children who are eligible for these school meals don’t eat them. Sometimes that’s because red-tape around eligibility determinations gets in the way, but all too often it’s because children fear being stigmatized for taking a free school meal. There’s now a solution to both of these issues. Community eligibility, an important new feature of the National School Lunch and School Breakfast Programs, can help schools in high-poverty areas meet the nutrition needs of school-aged children by serving breakfast and lunch to all students at no charge. 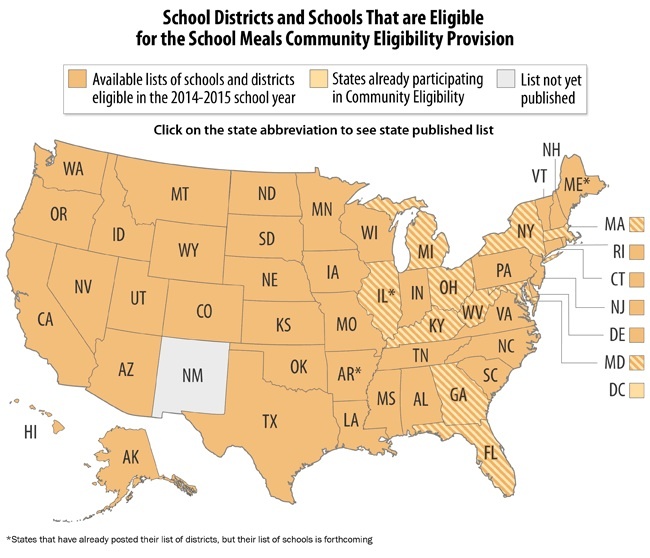 Community eligibility, which is already operating in 4,000 high-poverty schools in 11 states, will be available nationwide for the 2014-2015 school year. In school districts with high concentrations of poverty, the entire district can qualify for community eligibility. Otherwise, individual schools or groups of schools can qualify. States have now published lists of the more than 25,000 schools that qualify for community eligibility. More than one in five school districts across the country could implement community eligibility district-wide. But school districts must decide by June 30 if they want to implement community eligibility in some or all of their qualifying schools for the 2014-2015 school year. Because community eligibility is new in 40 states, some school districts that could benefit from participating do not know how it can benefit both schools and students. Community eligibility streamlines program operations, freeing up staff time and resources to improve the quality of meals served or to focus on other education priorities. Most important, in school districts that have already adopted community eligibility, more children eat breakfast and lunch at school. As a result, community eligibility is helping to address child hunger in those areas. Growing up in poverty and without reliable access to food can have lasting effects on a child’s health and ability to learn. Community leaders and policymakers in high-poverty areas—regardless of whether they work on hunger issues—can alleviate child hunger by making sure their local schools know about community eligibility so they can take advantage of this powerful new tool to help children. For more information about implementing community eligibility, please contact Becca Segal at rsegal@cbpp.org. Barbara Sard is vice president for housing policy at the Center for Budget and Policy Priorities. She served 18 months as senior advisor on rental assistance to HUD Secretary Shaun Donovan. She previously held the director’s position at CBPP between 1997 and 2009.